Browse competitive events and content release schedules – or add your own – on this a fan-built community calendar for Eternal. 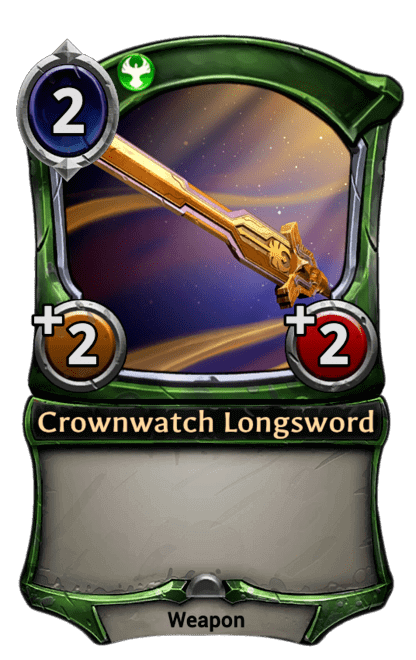 I’ve spoken to a lot of people who say they want to participate in competitive Eternal events or tune in to Eternal-related streams and casts – but either they aren’t aware of them, or just plumb forget when they are happening. The Eternal community calendar is an attempt to address this. You can export events to your personal calendar to ensure you will never miss a deck registration deadline or your favorite podcast again. Or spread the word about your own Eternal-related event or content release by submitting a new calendar entry. Since then a few days have passed, and both reactions have held up. 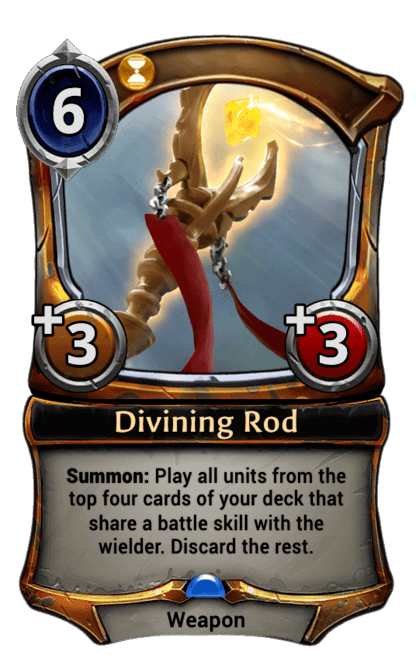 For starters, I applaud Dire Wolf Digital for investing the extra work in designing and implementing a powerful new mechanic that is sure to shake things up in Eternal. Like manyplayers, I am already having fun just imagining the deck-building possibilities that Markets will open up. The implications for hand manipulation, tutoring and power correction make this design even more appealing. 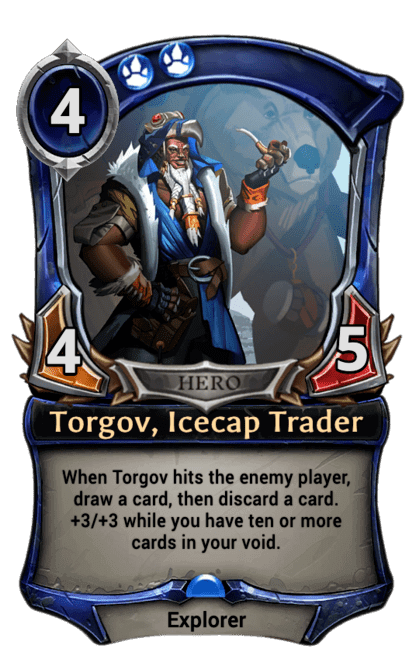 On top of everything else, Markets will be a great introduction to situational deck-building for those players who may have never used a sideboard before. Selecting a secondary set of cards to be used in particular match-ups can take some getting used to. Markets are an imaginative way for novices to gently grow accustomed to this approach in a Best of One setting. At the same time, I can’t ignore this feeling of apprehension that the introduction of Markets means we will never see full support for sideboards in Eternal. Side-boarding permits an extra layer of strategic depth in card games that is just not attainable otherwise. 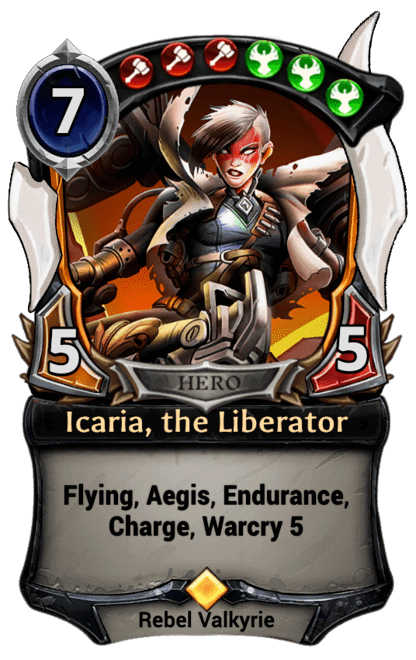 We know that Eternal will be getting Organized Play (with cash prizes!). And that some of these competitive events will use a Best of 3 format. 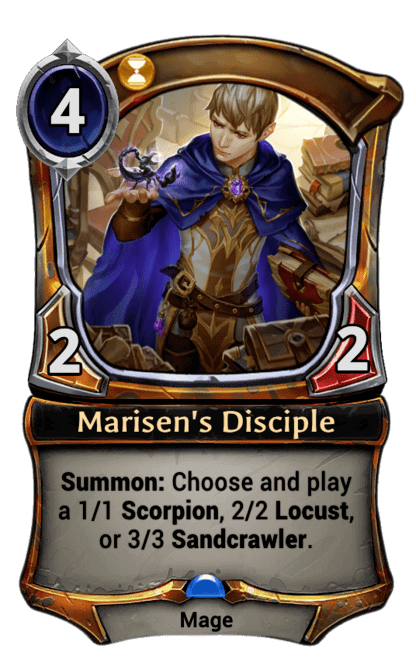 We also know that Markets will be the “intended stand-in for sideboarding” in Organized Play, as revealed on discord. 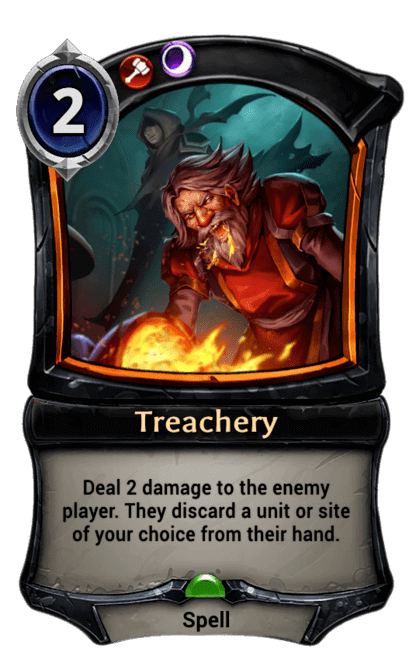 Ultimately it would be a disappointment if formal support for this aspect of deck-building in Eternal ends up being restricted to a maximum of 5 cards, and only to decks that include Merchants (or any future cards with Market interaction). 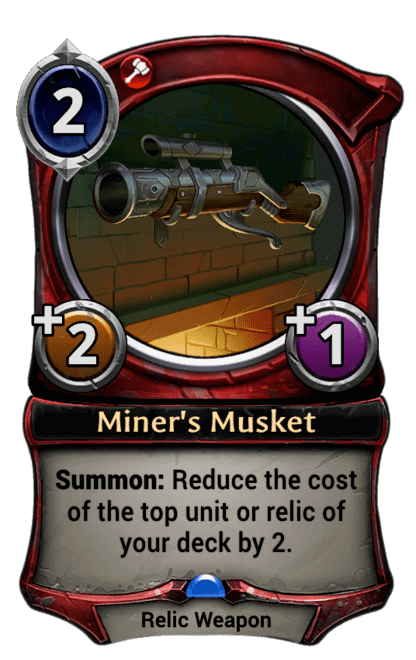 While the introduction of the Market feature has exceeded my expectations for new card mechanics in Set 4, I sincerely hope it does not shut the door on full support for sideboarding and a persistent Best of 3 mode in the future. 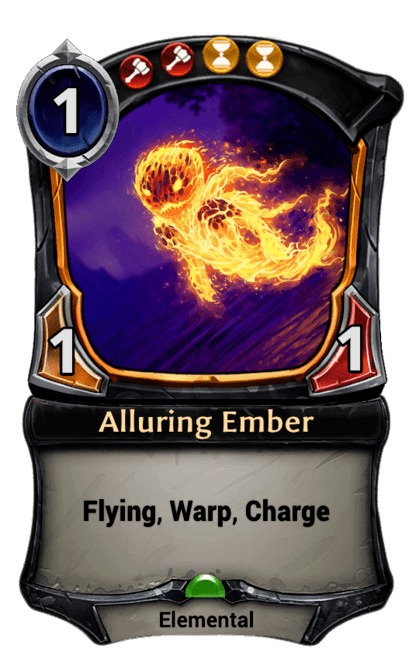 It existed in Eternal’s beta stage, so we know it is doable. Meanwhile, you can get your Best of 3 fix by participating in one of the many events hosted by third party tournament organizers such as: RNG,The Great Parliament or Kaelari. There is even a 24/7 Best of 3 matching queue on Kaelari’s ladder. Check out Shiftstoned.com for a calendar of events. 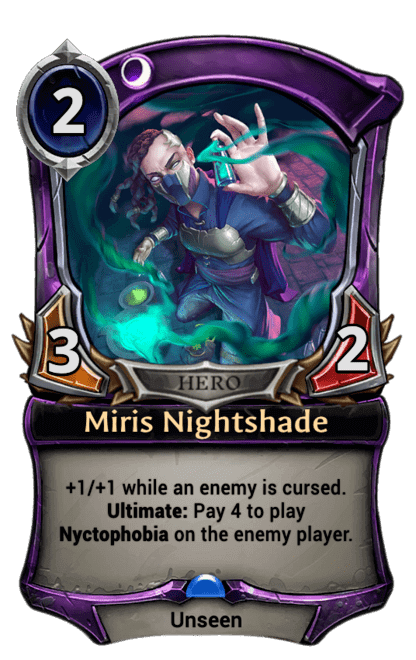 As a lore-lover, I am excited to see that each of the Merchants appears to be a flavorful personality who expands our understanding of Myrian geography. 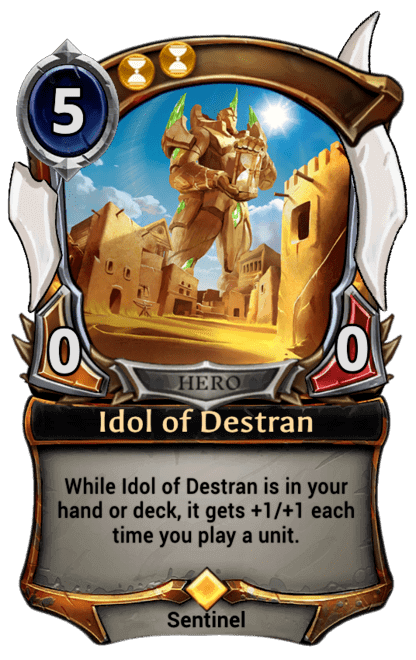 What more will we learn about these exotic settings when The Fall of Argenport releases? This is not the first time we’ve seen vaulted desert architecture in Eternal. But knowing that it exists in a location which is likely called Auralia just deepens the sense of place. As you might expect, the merchant for Time offers us a selection of mysterious magical objects. A crystal ball for sale, naturally. Some thirst-quenching potions. A mortar and pestle for conveniently grinding Shiftstone in the comfort of your own kitchen. And most impressively, a sick backscratcher that appears to have been made from someone’s actual hand. I drive through a town named Winchester on my way to work. But in my imagination, Winchest is a suburb of Argenport that borders Rakano. It is a stop between Crownwatch territory and that somewhat seditious settlement known as the “forge for the throne”. It is also where gearheads go to shop – both loyalists and rebels. They eye each other nervously over the racks of merchandise, wary of a violent outbreak. Or worse – a personal embarrassment, such as dropping a tool. In stalls like the one pictured here they haggle with vendors over swords, shields and even drones. If they know how to ask the right questions, they might get to see the back room where this Tinker merchant keeps the Big Green Thing. While his garb suggests a geographic proximity to Auralia, the merchant of Jennev appears to be on the go. Myria’s many Explorers have demonstrated that the pursuit of knowledge will not be impeded by great distances. This is even more true of the pursuit of profit. Jennev Merchant’s caravan might be found anywhere along the expansive route between Amara and Skycrag. His wares reflect the diverse locations visited along the way. 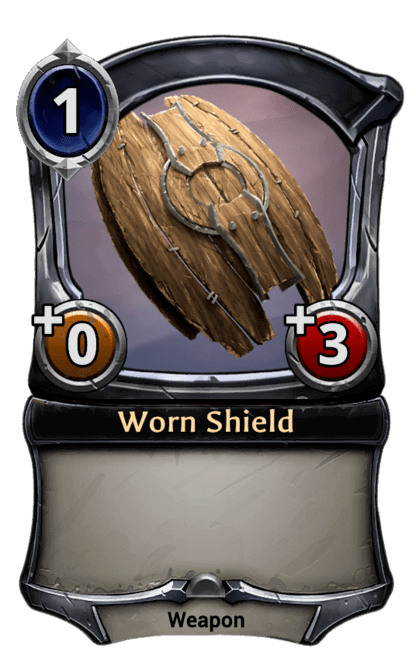 A worn shield. Some shadowy potions. Destran pottery. A discarded helmet. He will gladly trade you any of these items for that Oni beard ornament you recently came across. Speaking of beards, Shadow’s Merchant really knows how to rock a soul patch. I bet my dude is from Stonescar originally. But currently he makes his living on the street corners of Kerrendon. Whether Kerrendon is a district in Argenport or a different metropolis altogether is a tantalizing question to ponder. K-Merc has learned that enemies can be dispensed just as effectively with poisons as with bullets — if not more so. He wants to share some of his toxins with with you…for a price. He’ll even throw in a few sticks of incense at no extra charge, to help keep the authorities off the scent. Most of the time, Kerrendon Merchant is able to avoid Cabal extortionists who want a piece of the action by just packing up and moving to the next block. When that doesn’t work though, he gets on their good side by hooking them up with unauthorized bootleg recordings of Diogo Miloga’s upcoming studio album. I find Ixtun Merchant a lot more intimidating than the others. Something about the way she is holding that rifle makes me wonder if she is going to sell it to me or shoot me with it. Of course, a lady can’t be too careful in Ixtun. Which I’m going to guess is somewhere on the border of Stonescar mining territory. The “gently used” Grenadin for sale are a tip-off. 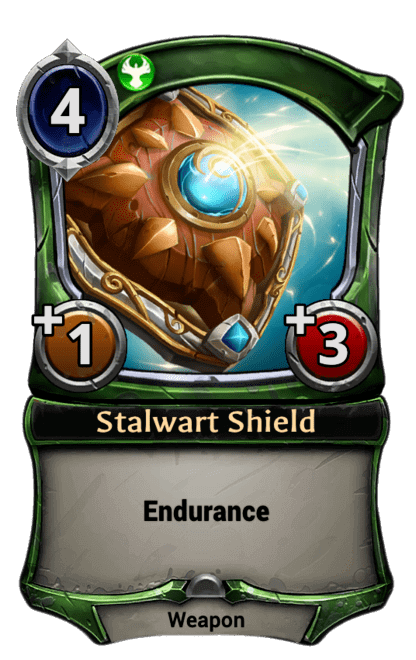 Save some gold by adding your own Shiftstone, and you can activate them on the cheap. Miners are a rough lot. To say nothing of the bandits and slavers who inhabit the region. So I guess I don’t blame her for being cautious. Just be sure to keep your hands where the lady can see them, and I bet you’ll get a fair deal. The meta shifted a lot during Chapter 18, so this deck went through a number of iterations. This is the version I finished the month with, peaking at Rank 16. I have a lot of (mostly harmless) questions to ask about this card. That Elf in the foreground is the one being stunned, right? And I assume the woman standing behind him is the one doing the stunning? Did the lady take offense to some question that was presented to her? Or was she the one doing the asking, and then not pleased with the answer she received? Am I missing something obvious? At first I thought the shape above the dude’s head was an exhalation, as if he was blowing out a smoke galleon. But at full-size it becomes clear that this is the lady’s hand, and she is using it to magically extract some life essence from between his lips. I get how that might prevent you from attacking or blocking until the start of your next turn (at least). But I still don’t understand how this is related to asking a question – harmless or otherwise. To be clear, I’m not complaining – I think the artwork is fantastically evocative. We’ve already met several individuals with lots of personality in Set 4, and this illustration is no exception. I’m just really curious about what is going on here. This Elf looks unlike any other we’ve seen, although his ears give him away. 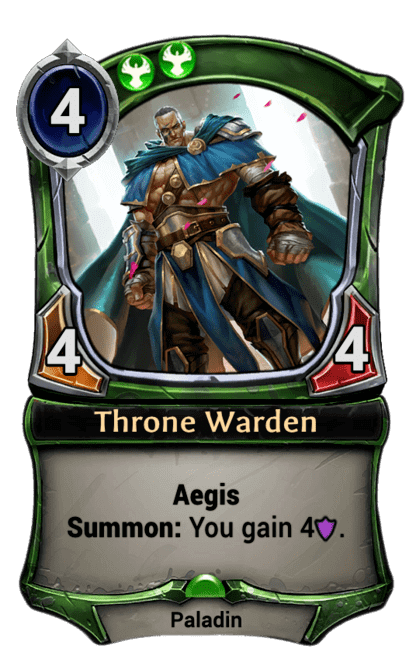 His ornate pauldrons might be something worn by a member of the Crownwatch, and that would kind of make sense with this card being in Justice. Except…why blue? Is he some kind of Feln ambassador? Beyond that, perhaps the most important question is: Why does this card exist? 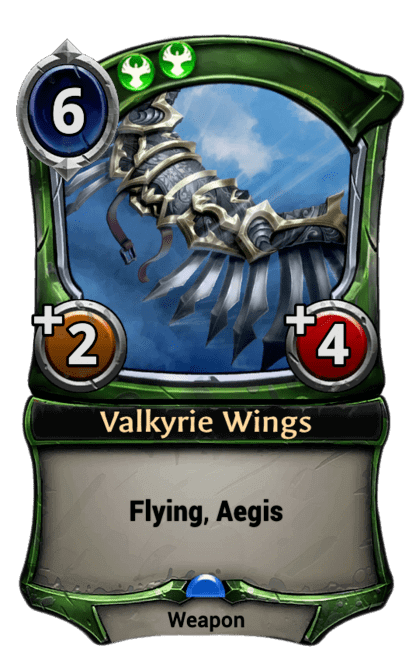 Is it simply to reinforce the trend that being Green means you get cards that are like other cards, but your cards are just plain better than those? 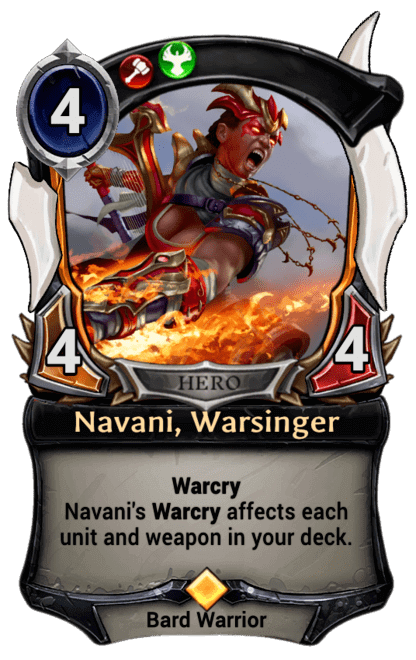 Speaking of cards that are just plain better than others…if being in Justice gives you a discount of 2 power, adding Warp to a spell apparently costs 4 now? 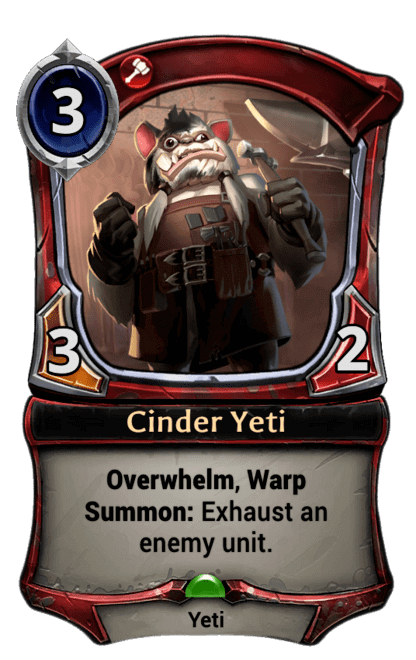 Stock prices just went up for hyper-aggro decks that can’t get enough Cinder Yeti. And also for units with Endurance. 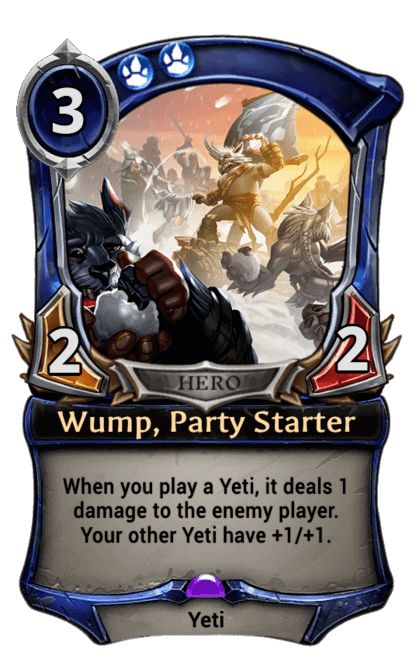 The artwork is clearly a pre-cognitive portrait of me (minus the horns and beard) after being beaten down by umpteen Grenadin and/or Yeti decks in a row. I expect to see this card most often around Diamond I when I’m at 99/100. Oeh! Huzzah! I thought that the artwork announcing A New Chapter seemed unfamiliar at the time. 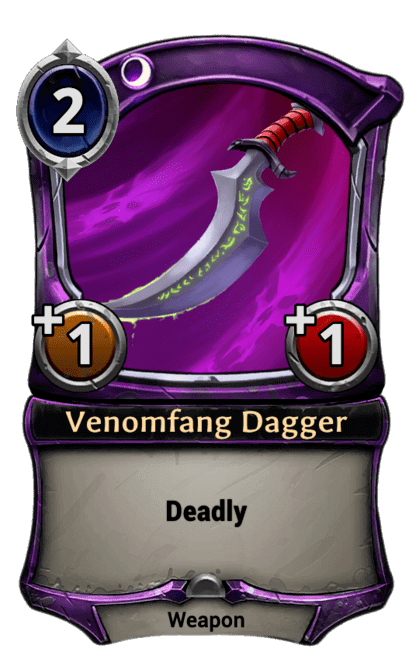 Looks like we actually received our first Set 4 spoiler back in March without even noticing it. 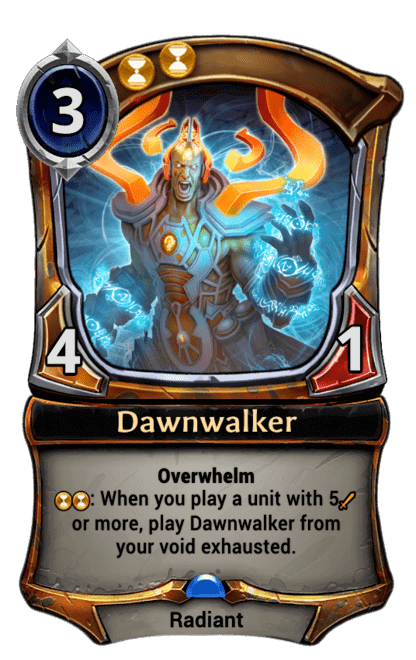 A cycle of Transmute 5 Spells is very exciting, and introduces a number tantalizing possibilities. 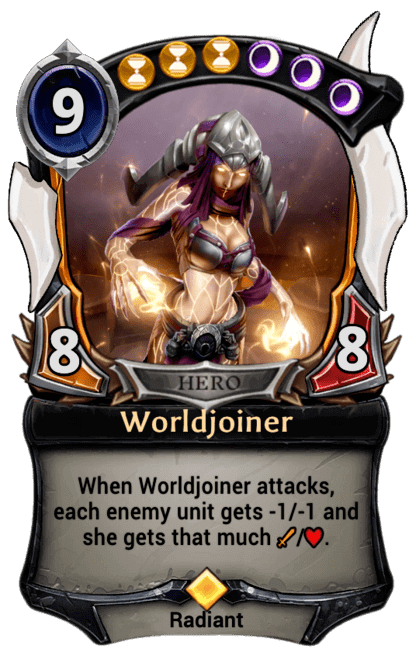 More power base options makes deckbuilding a lot more fun and interesting IMO. 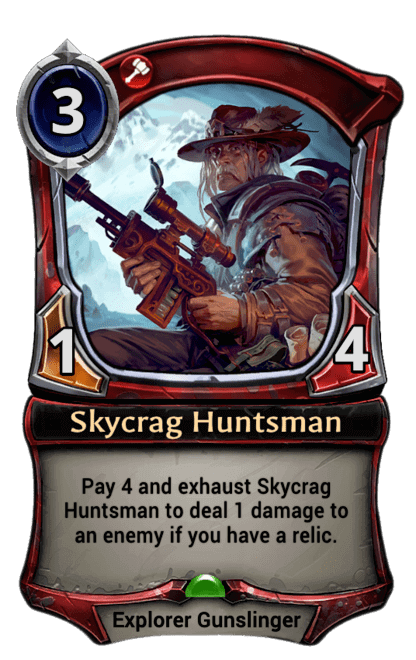 Appropriately, the standard bearer for Primal is a Clan soldier. Presumably she is marching on Argenport during the events of Chapter 17. At this point we can only speculate about what a Clan Tactic does. 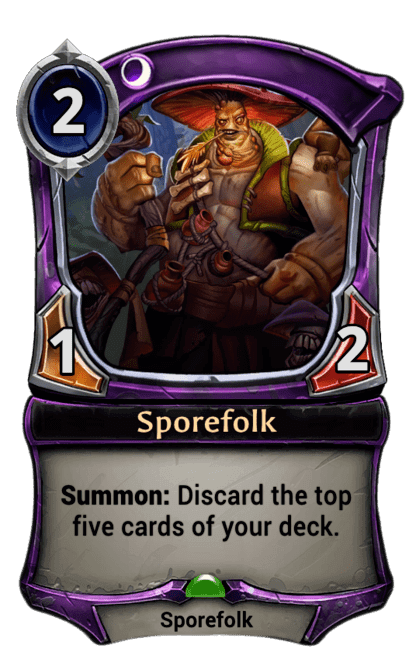 But something to do with selective draw and discard seems like a safe bet. I can’t help but wonder who the other standard bearers will be. 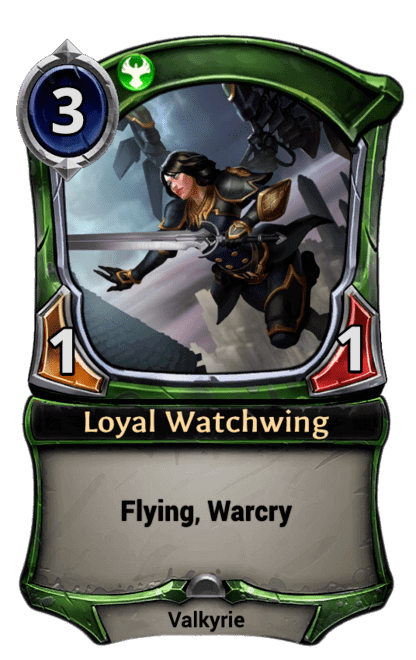 Being associated with the most organized military force in Myria, it seems obvious that Justice would choose a Valkyrie or a Paladin to carry the Crownwatch Standard. Does this mean it would Transmute into a Crownwatch Tactic? Or something different altogether? 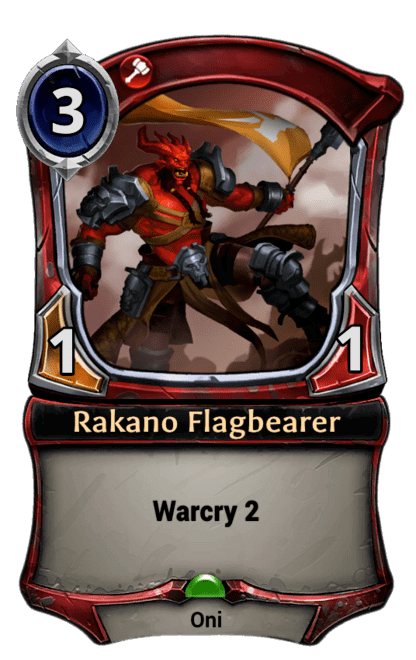 Rakano already has an Oni flag-bearer, but you may have forgotten about him since he sees so little play. 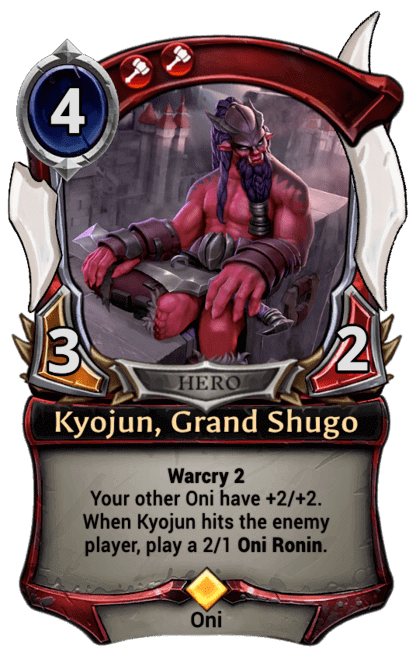 Still it would be fitting if a Rebel Standard in Red would be borne by an Oni. 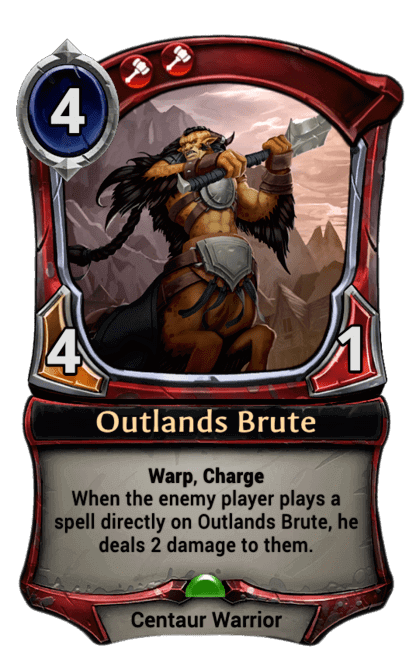 Gunslingers and Grenadin are presumably less concerned with battlefield symbolism, although a Centaur might not be out of the question. While I know what Standard Time is, what would a Time Standard look like? My sense is that Radiants and Wisps are too otherworldly to bother with heraldry. And as far as we know, Dinosaurs and Sentinels are illiterate . 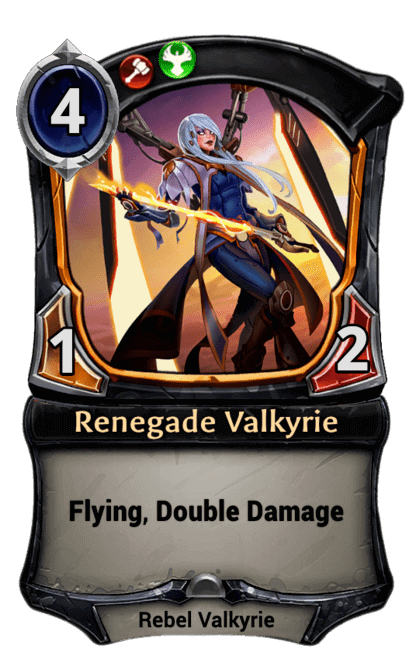 So…should we expect an Arcanum Standard borne by a Mage? Or perhaps an Amaran Standard, proudly held aloft by an Explorer? Maybe a Copperhall Standard, carried by a Minotaur? I dunno…that would seem to be rooted more in Combrei rather than mono-time. I’m stumped here folks. Please help me out in comments section. 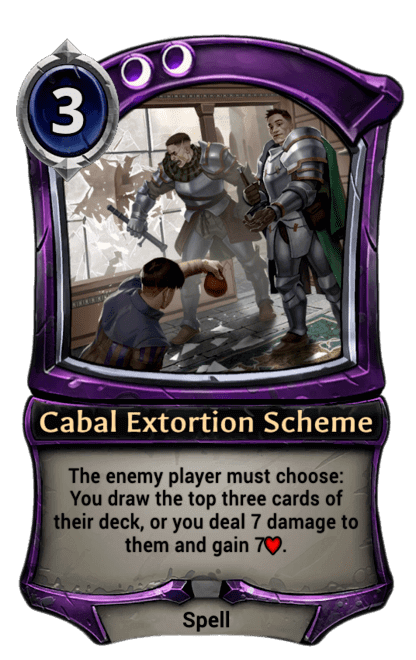 A Cabal Standard would be relevant color-wise, but again – you don’t really want to advertise the fact that you are a member of an secretive crime syndicate. Here a young citizen is imagining the foes he will vanquish and the spoils he will gain. 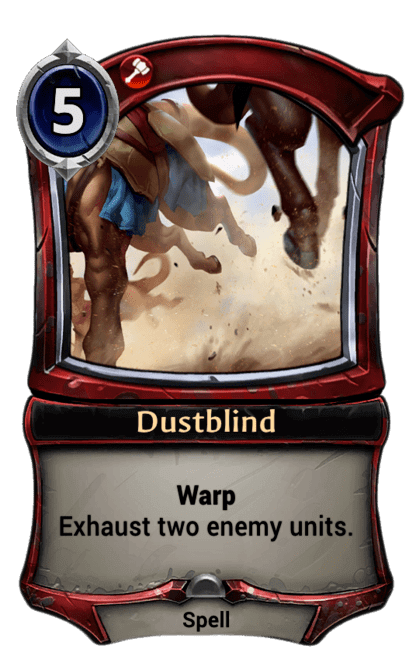 For some reason though when I look at this card, I imagine the broken things my opponent is going to do with it rather than the other way around. Probably because the top cards of my deck are never the ones that I need. 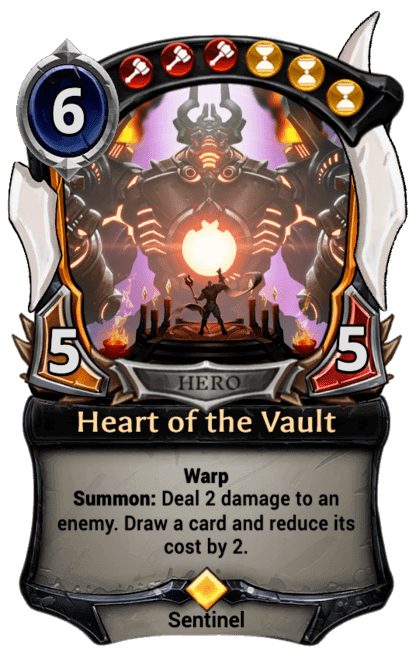 But inevitably my opponents will play Icaria, Kaleb and Heart of the Vault all from one rodded Alluring Ember. 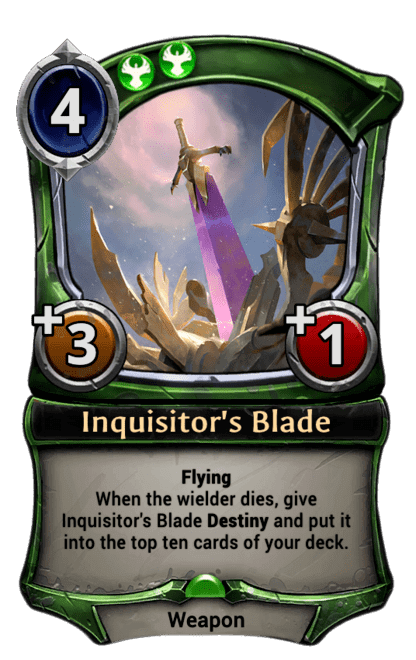 Or draw an 8/1 Inquisitor’s Blade with Destiny to play on Tavrod immediately. I don’t have reason to believe that Answer the Call will be any different. My opponents calls will be answered, but I’m sure to have a dropped connection. 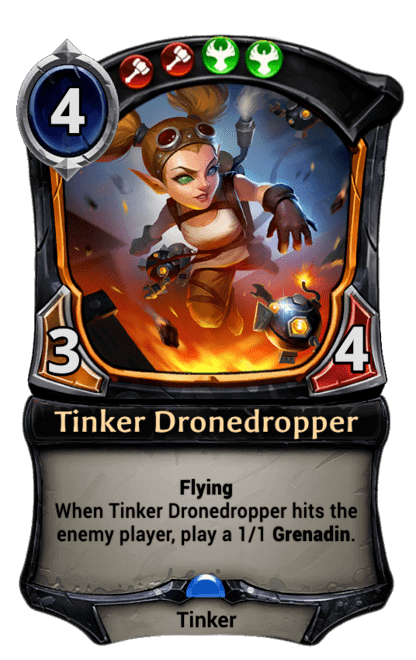 I am definitely not looking forward to getting hit in the face by all those Flying, Charging, Deadly Tavrods with Double Damage, Warcry and Lifesteal. But you can look forward to watching me pay 6 just to discard the top 6 cards of my deck. Cue the Mindfire face emoji. I like the idea of putting Curiox together one piece at a time, Frankenstein-style. 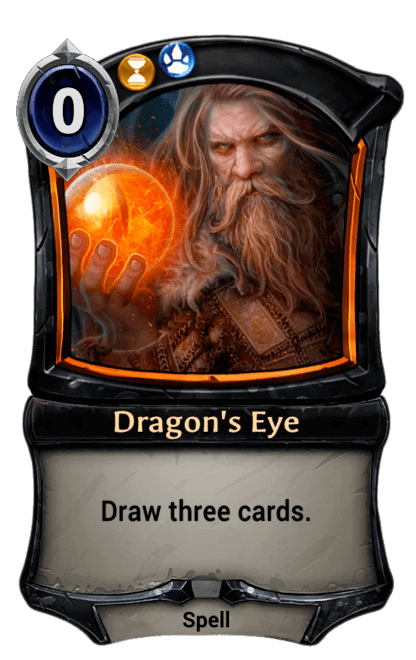 Play his Eye, then draw his Claw to deal 3 damage to the enemy unit of your choice. If it is a favorable trade, maybe the Claw will stick around for a while to do even more damage. Deliciously gruesome. 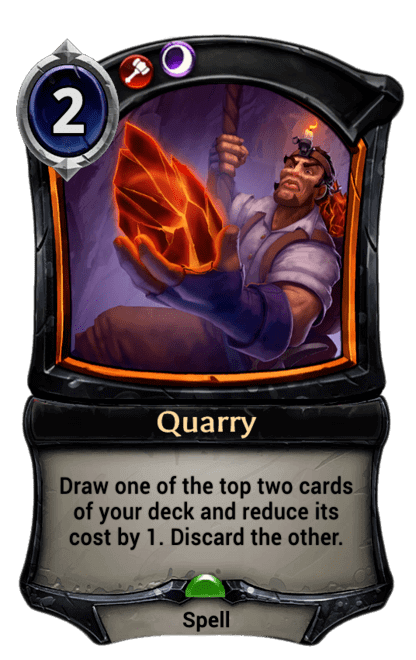 The absence of a rarity gem indicates that this card is a token – so it is hard to evaluate without the full context. But why let that stop us from engaging in wild speculation? 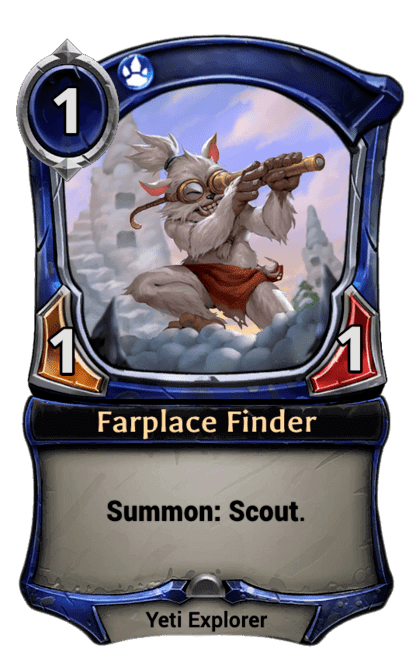 How about a payoff for assembling a complete Curiox? Play two Eyes, two Claws, a Tail, and a Torso…win the game? 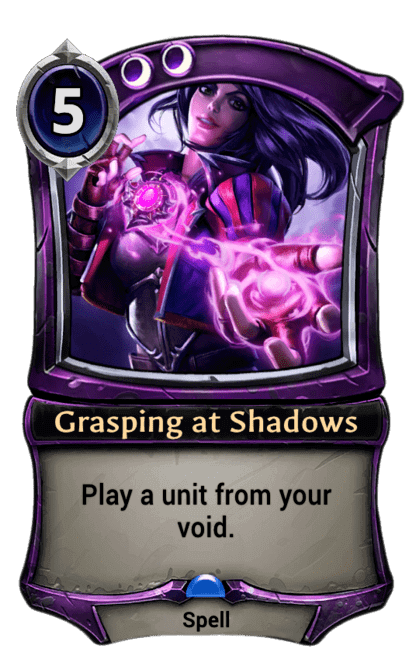 It seems unlikely that Eternal will feature an Exodia effect anytime soon, but one can dream. A safer bet though would probably be that this is shuffled into your deck somehow from another card. 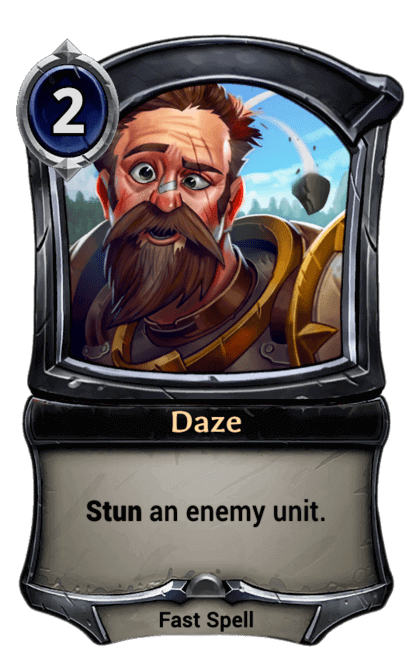 The Dusk Road period did see a smattering of Fate cards, so probably Claw is generated by one of those. Wherrrre issss it? Can anyone who has played Clank offer some additional suggestions in the comments below? 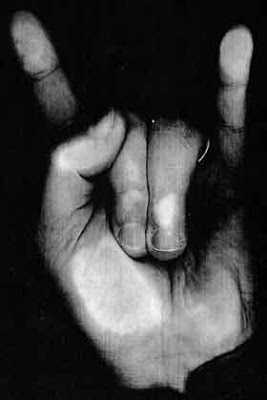 Wow…actually does look a lot like the drummer for the Void, my short-lived post-college doom metal project. 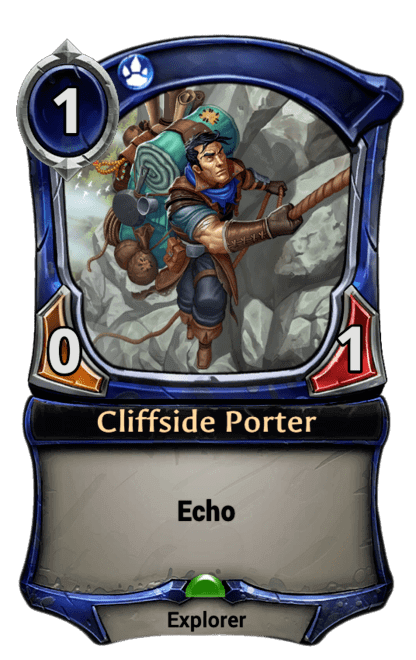 Our third Wisp out of the cards and illustrations spoiled so far. 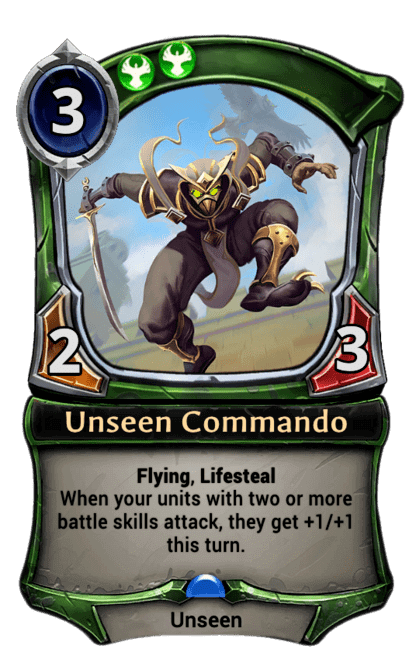 I’ve been wanting to find out more about these little guys – as well as their Radiant companions – and it is looking like Set 4 will not disappoint. 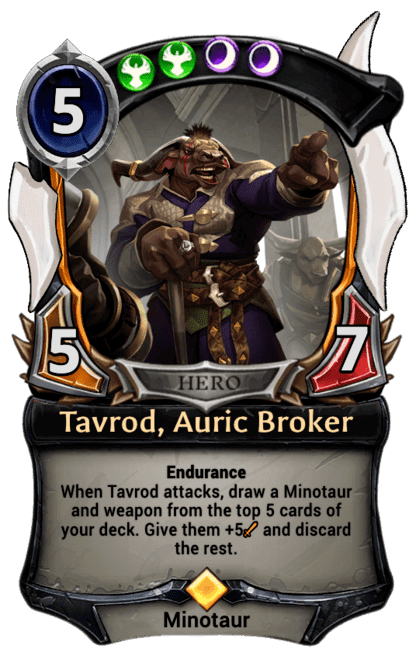 The notion of another mid-cost Legendary that works in Xenan has got my toes tapping. 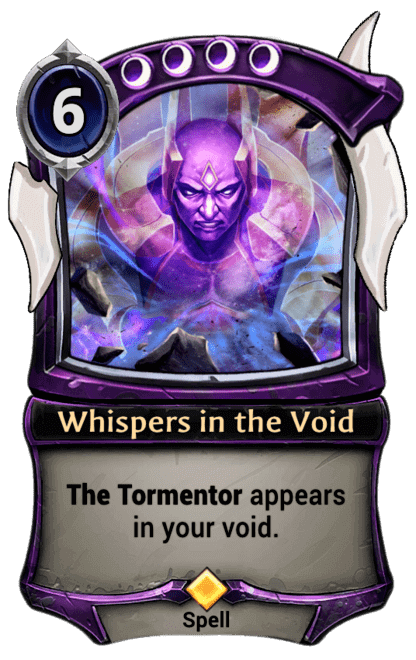 Giving it some Void synergy makes this even more my kind of card. Without the Unblockable keyword this card would have a lot less potential. 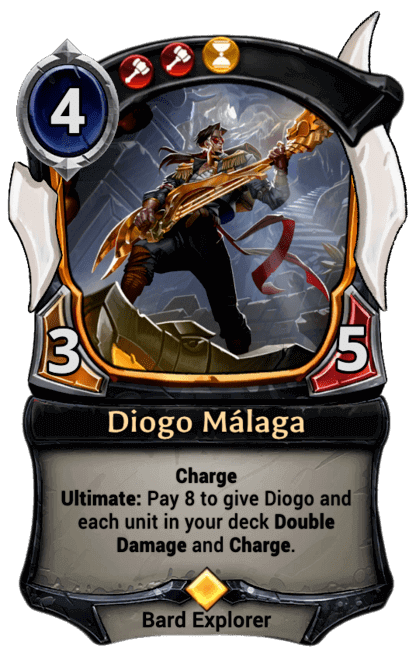 But when you consider that any deck playing Drummer is likely to include more than one copy – along with recursion effects – a 4+/4+ Unblockable for 3 suddenly becomes a lot more interesting. This is before we even mention Dawnwalker or Ephemeral Wisp. 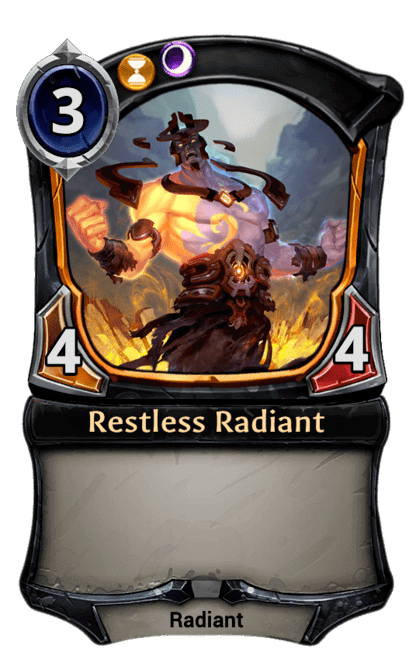 Plus any new Void-love or Wisp-Radiant synergy that Set 4 may bring. I mean, once we see Void Guitarist, Void Vocalist and Void Bass Player things will really heat up. Throw the goat and crank it! Huh…looks like Cirso’s Choice may be more than a rumor after all. 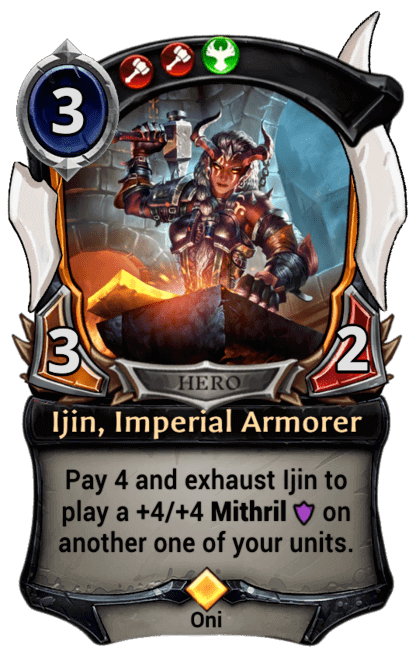 Apparently multi-faction modal cards are no longer just the purview of Eternal’s Scions. Perhaps this cycle is where the recently dubbed Heroes of Myria will begin to flex their muscles. If the rest are as interesting as Rindra’s Choice, we have a lot to to get excited about. 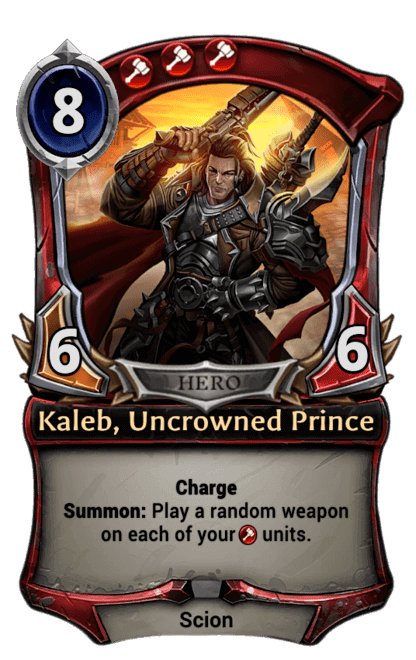 An inverted Annihilate and bizarro Kaleb’s Choice rolled into one? This card has Playable written all over it. 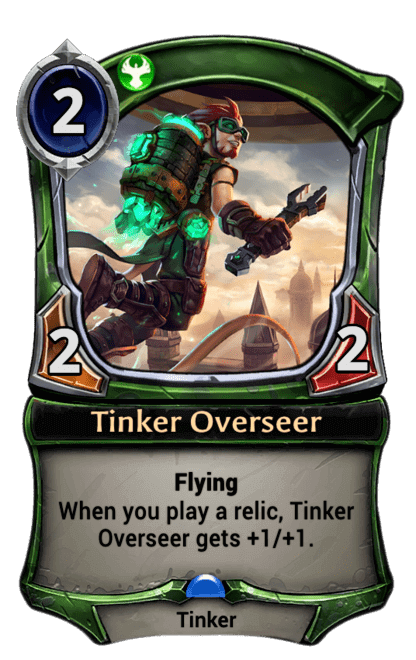 Just about every Feln deck on the midrange-to-control continuum will want to include this. Of course I can’t help but wonder who the other Deciders will be. 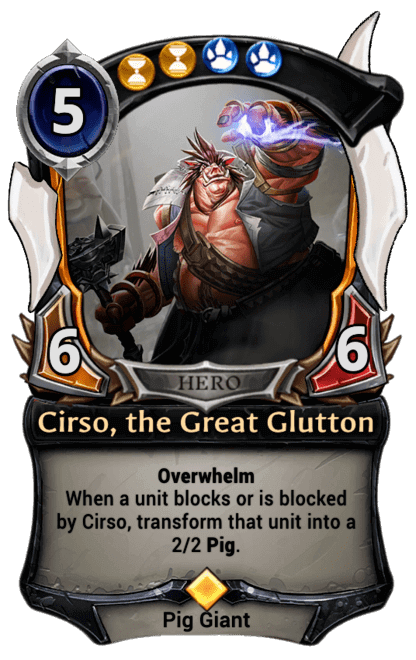 If we have Cirso in Elysian that leaves…who? 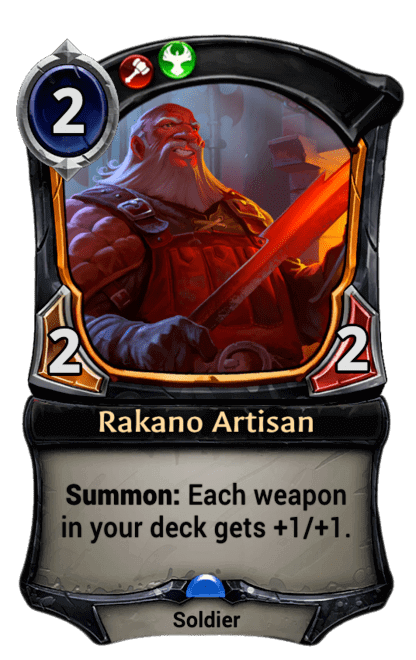 Rakano could go with Ijin, but my money is on Navani’s Choice. And it being some kind of modal Weapon or Unit buff: “Each weapon in your deck gets +1/+1, or Each unit in your deck gets +1/+1″…? 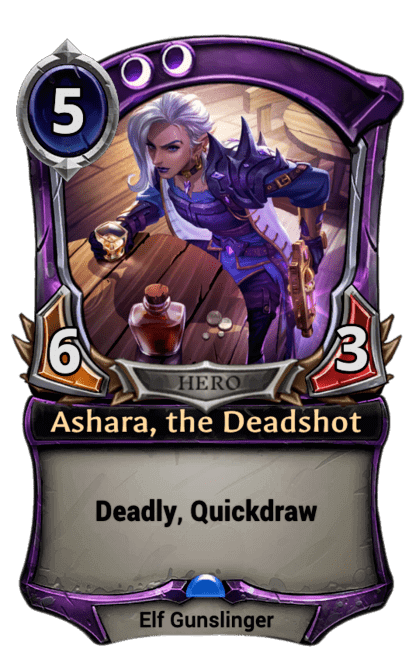 It is hard to imagine that Stonescar would not feature one of Eternal’s most popular Gunslingers, even though she doesn’t have a proper name. 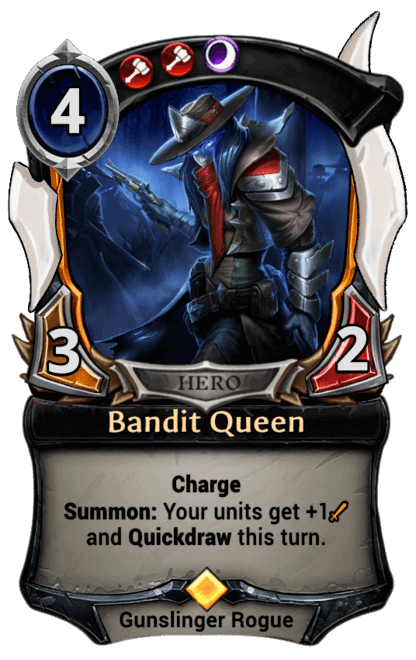 What would the Bandit Queen’s Choice be? 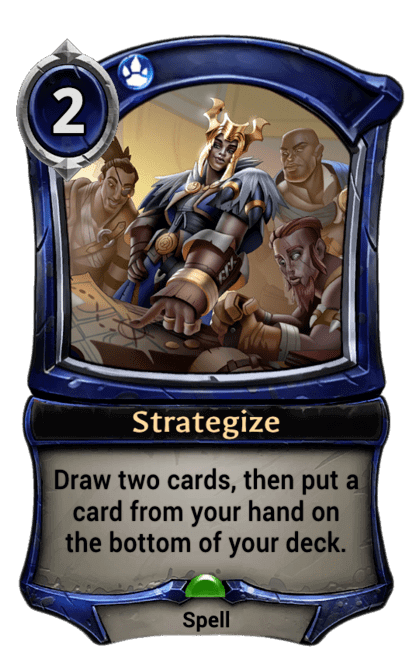 “Give your units +2 Attack and Charge this turn, or Give your units +2 Attack and Quickdraw this turn”….? 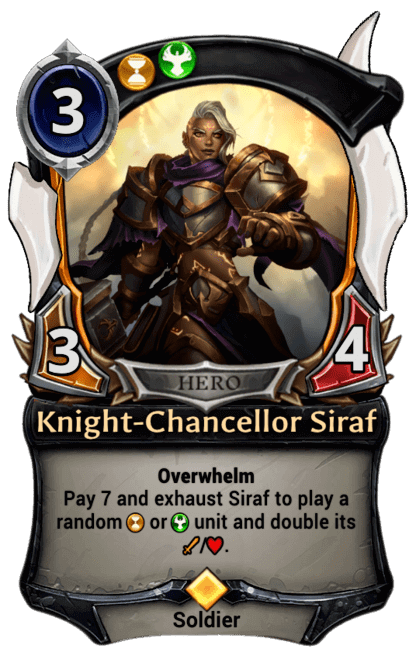 Siraf’s Choice is more of a headscratcher. “Double one of your unit’s Attack, or Double one of your units Health”….maybe? 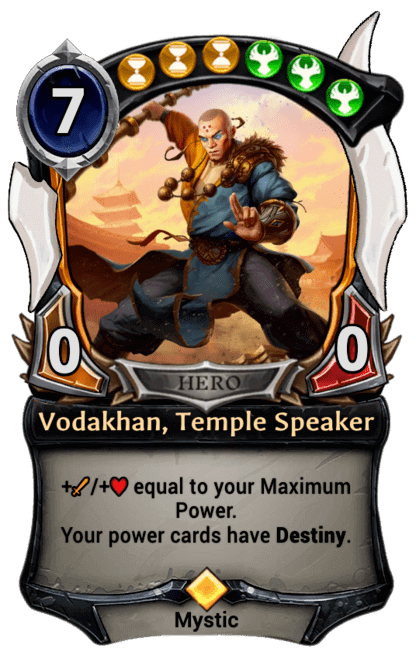 Or is it Vodakhan’s Choice? We won’t know for sure until the remaining Choices are revealed of course. In the meantime I’ve decided it is fun to imagine the possibilities. And I’m really interested to hear your thoughts in the comments section. Wow. Starting things off with a bang. There is a lot to like about this one. Evergreens. A badass Elf. Explosions. Too many belts. I’m really curious to find out how this scene fits in to the overall story arch of Set 4. 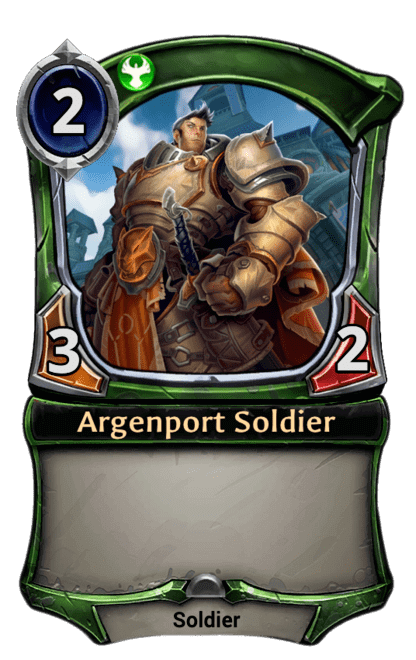 Following on from the events of Dead Reckoning, do the Elves of the Direwood strike back in revenge against Argenport? Or is this possibly a flashback, giving us some background on a younger Ashara? Who or what was in that wagon that was so important? And have Lethrai clothiers made some major advancements, or does this lady just shop elsewhere? Since there seems to be as much emphasis on the action as the character herself, I’m guessing this card will be a Spell rather than a Unit. It is not a big leap to assume we are in Fire here, but the presence of an Elf suggests it may be dual-faction. 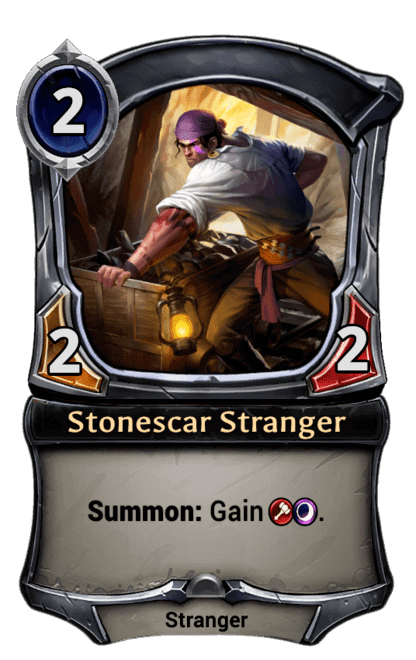 A Stonescar ability that deals damage and also disrupts your opponent’s hand? 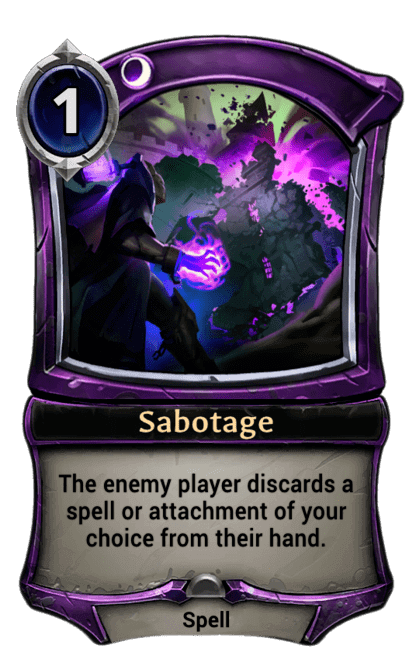 Forced discard definitely seems to fit with the theme of fiery sabotage depicted here. Most of all though, I love the swagger. Casually tossing a torch over her shoulder. Grinning subversively. Eyes aglow with a sense of satisfaction that can only come from completing a dangerous mission. Let’s hope the rest of Set 4 has this much personality. Speaking of personality, here is another mysterious lady on a mission. This one moving in shadow – and only Shadow by the look of it. 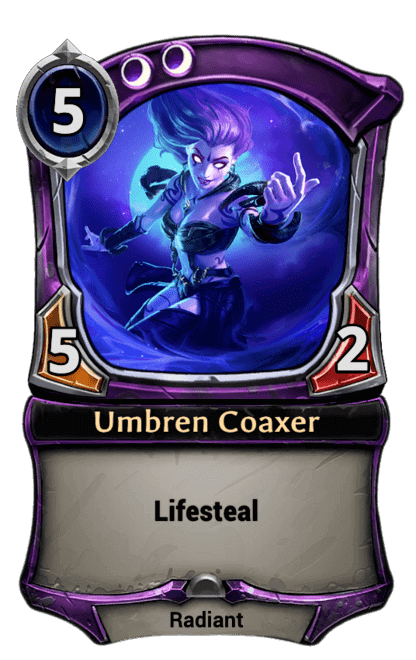 When this image was revealed on discord, there was some indication that it may depict an Umbren. I was skeptical at first, but if you look closely there is indeed a strong resemblance to a certain Coaxer, right down to the facial markings around their eyes. If she is in fact an Umbren, she is clearly different from the others somehow. The hooded robes and urban setting distinguish her from any of the other Radiants we have seen so far. My hunch is that she is in disguise, attempting to pass for human in order to pull off some covert scheme. Those shadowy spheres attached to her belt could be a clue: Are they explosives of some kind? Poisonous gas? Is she in cahoots with the Elven pyrotechnician that we met earlier? 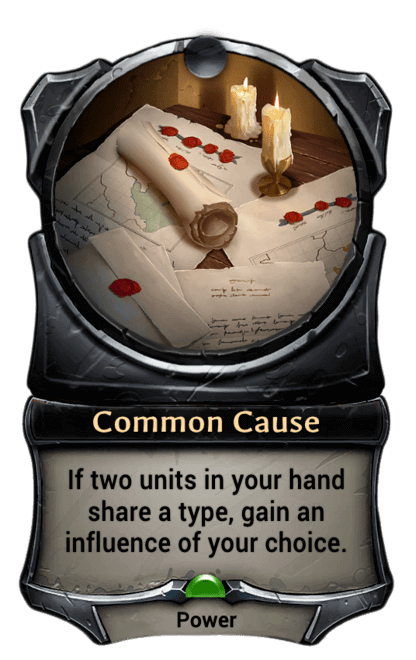 Are Lethrai and Xenan conspirators engaged in a campaign of guerrilla warfare directed at the Throne? 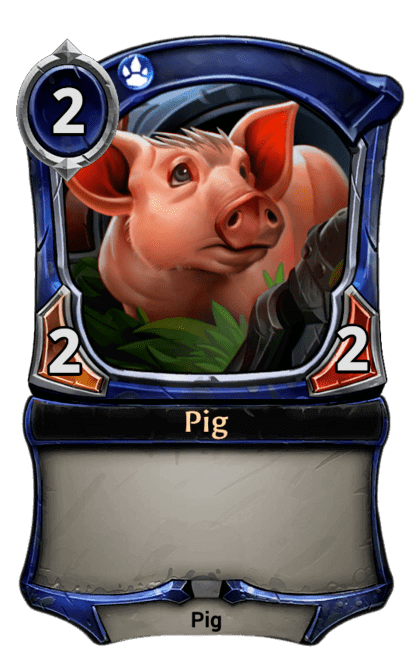 This seems more like a portrait to me, so I’m guessing the card is a Unit. The air of intrigue and stealthiness makes me hope she is Unblockable. 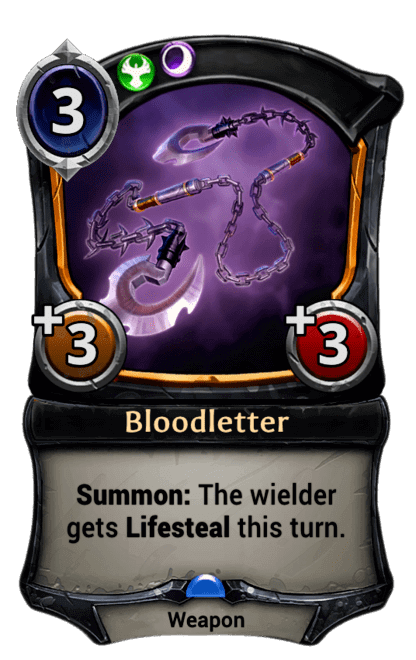 Would Deadly and Unblockable be asking for too much? At this point though, it doesn’t even matter. 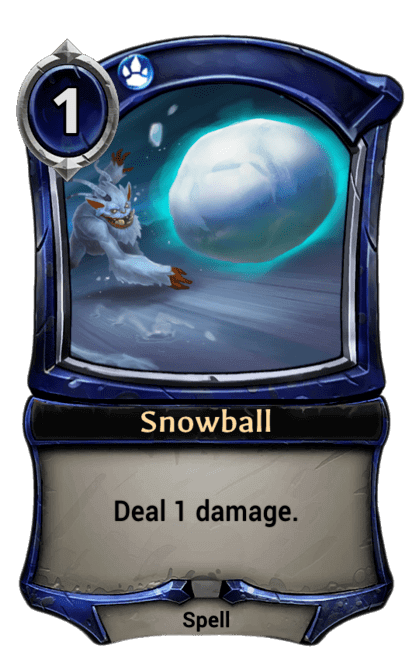 The atmosphere is so thick that the only thing I really want to know is….how long before I can add this card to my deck? 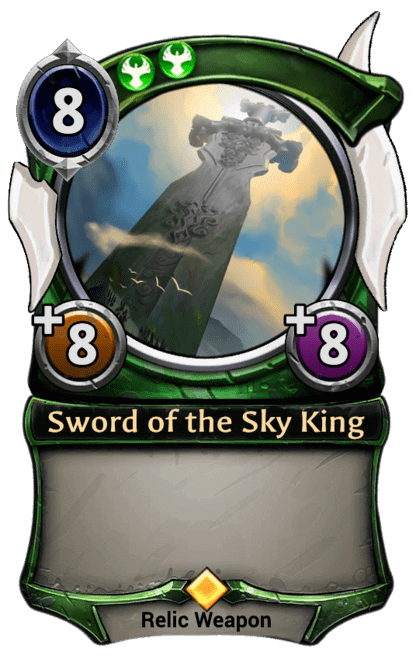 This piece of artwork reveals something truly unique, an enchanted item never before seen in the world of Eternal. 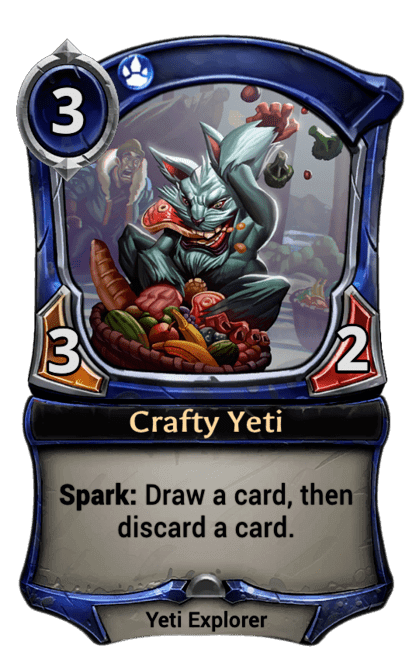 The Yeti seer’s enthusiasm lets us know that this shiny object he is exhibiting must be quite remarkable. Certainly it will leave a lasting impression on anyone who may be exposed to it. Is it a magical phenomenon of some kind? A gift from the Yeti gods? Is it made of crystalline ice? Is it…a very special snowflake? Its hard to tell if this card will be an ability or a Unit, but I’m leaning towards Unit. 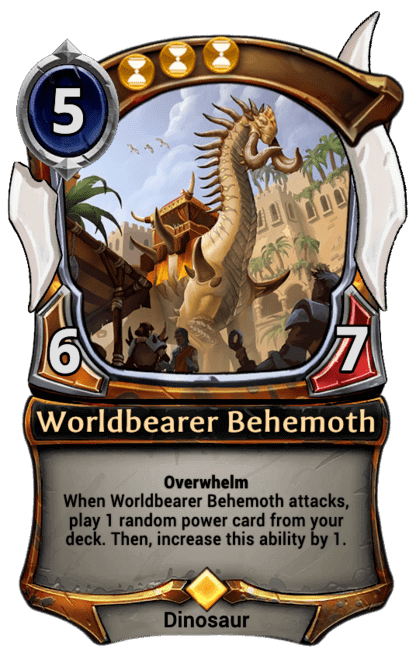 I want to say it is something related to Power gain, but that seems unlikely given the assumption that this is almost certainly a mono Primal card. 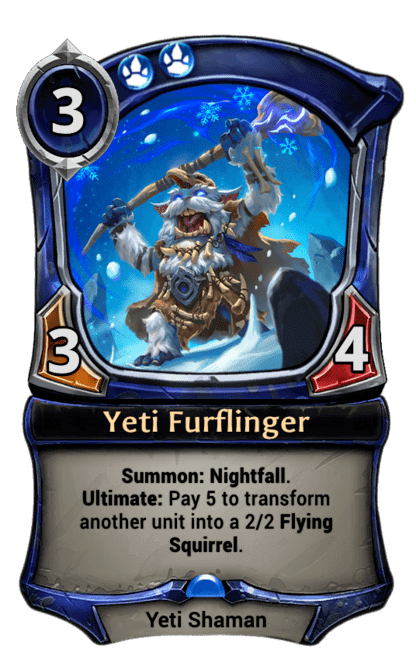 I guess we do already have Yeti Explorers and Explorer Yeti. A Yeti Shaman with some Time influence and a Power gain ability might not be that out of the question (note the yellow necklace). Then again it could just be a particularly sharp and shiny rock for packing in to one of those deadly Snowballs. That Set 4 would include some Dinosaurs is not a big surprise. Owls would also be a pretty safe bet. But Dinosaurs and Owls on the same card? Living together?! This could lead to mass hysteria. It is cute that Dino here apparently thinks he is an Owl. 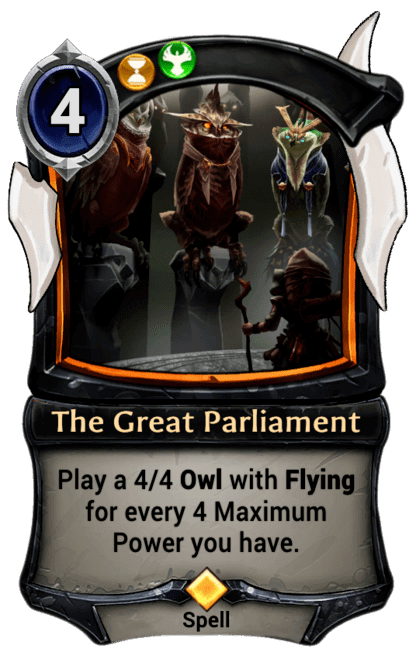 He’s just chilling with the rest of the parliament, unaware that he is more than twice the height of the others – or that his scales are not feathers. His avian companions do not seem so convinced, but they are either too polite or to afraid to mention it. If I had to go out on a limb (see what I did there? ), my guess would be that this is a Hooru Spell which has something to do with changing a Unit from one type into another. Turning Dinosaurs into Birds would certainly be appropriate in terms of evolutionary science. Maybe the text could read: Choose a Unit, and your other Units become the same type? 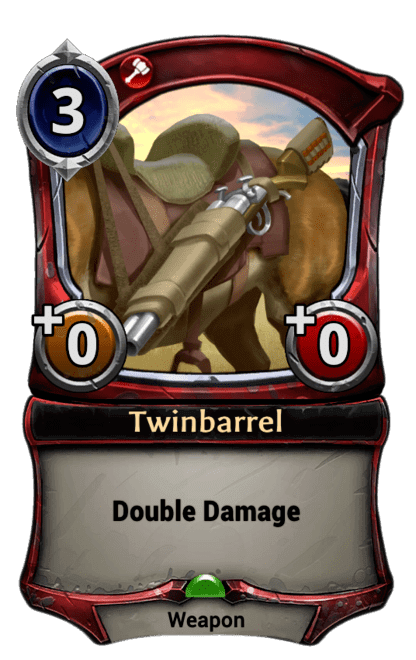 I’ve been hoping to see more cards like Common Cause that reward players for having multiples from a particular tribe. This is obviously useful for supported groups such as Dinosaurs, Gunslingers and Yetis. 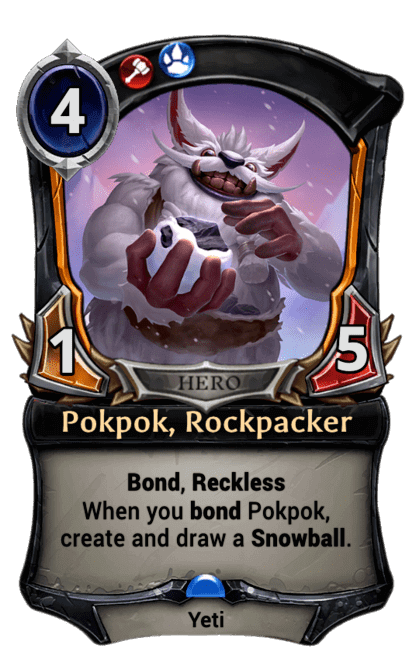 But it could also really be fun to enable deckbuilding strategies that work for Eternal’s more neglected tribes, like Rogues or Elementals. Maybe it is wishful thinking, but I feel I am just one or two new cards short of perfecting my Combrei Engine tribal deck. Desert surroundings? Check. 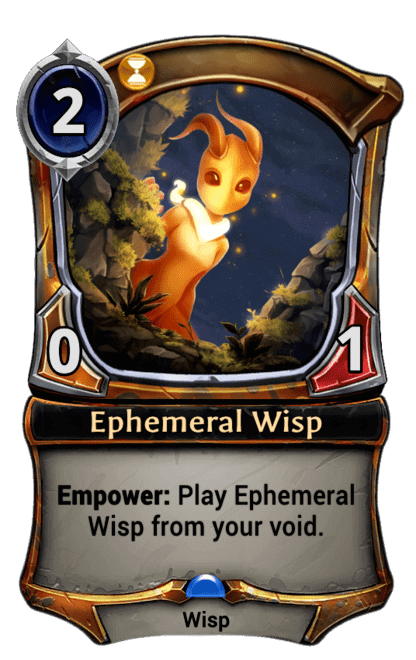 Wisp affinity? Check. Peanut-butter and huckleberry swirl around the navel: Check. Confirmed Radiant sighting, and almost certainly dual-faction. w00t! So what exactly is going on here? There is a lot on which to speculate. Further evidence that there is some kind of strong connection between Wisps and Radiants, for one thing. Mitotic Wisp looks like a baby version of the dual-faction Radiants, including the one we see here. The swirl of light and darkness on their torsos is nearly identical. 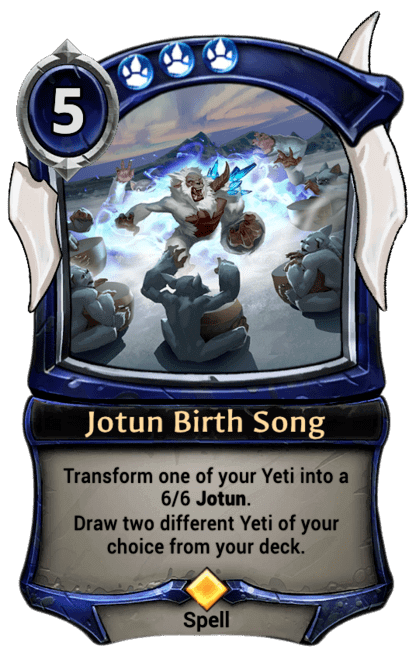 Which makes you wonder: Does the smaller species evolve into the larger one, in a way similar to the life stages of the Yeti-Jotun? (Google tells me that mitotic relates to cell growth…Eternal make you smaht!). 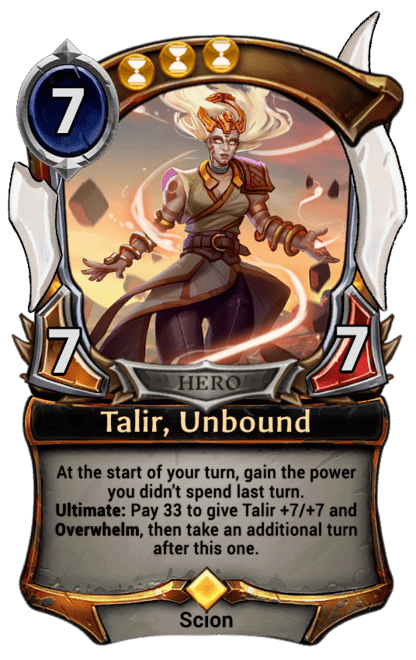 Some have gone as far as to wonder if what we may be seeing here is an evolved Talir, who has been exposed to enough Waystones that she has transcended humanity entirely and become a Radiant herself. Seems like a stretch to me, but there is a certain similarity. 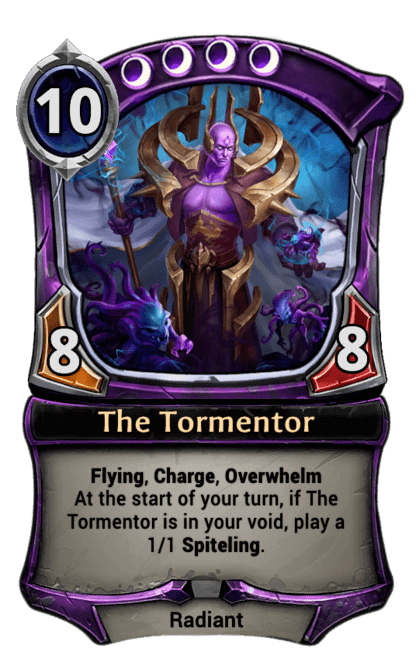 In any case, it has been a while since Xenan last received a truly impactful card. 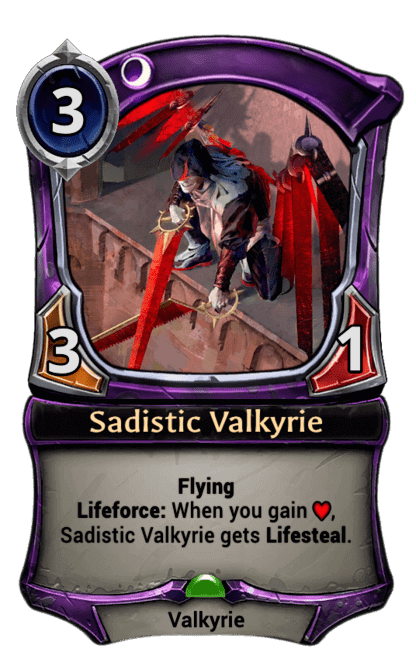 Cruciation appears very occasionally in full-on Lifeforce decks, and even then your other options for removal are probably better. 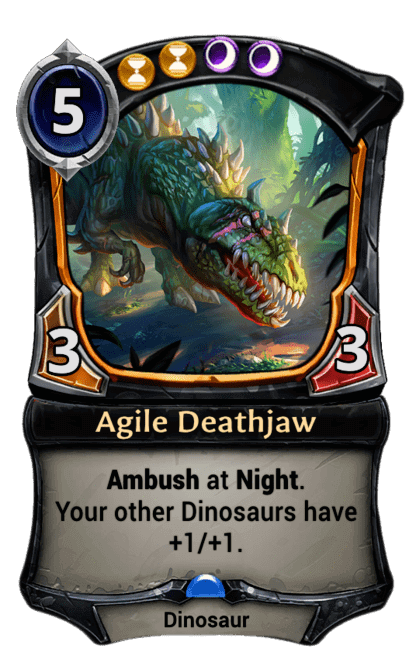 Agile Deathjaw does not even see play in dedicated nightfall Dinosaur lists. Duskwalker is given a rating of premium playable in draft but has yet to find a home in any serious constructed deck. 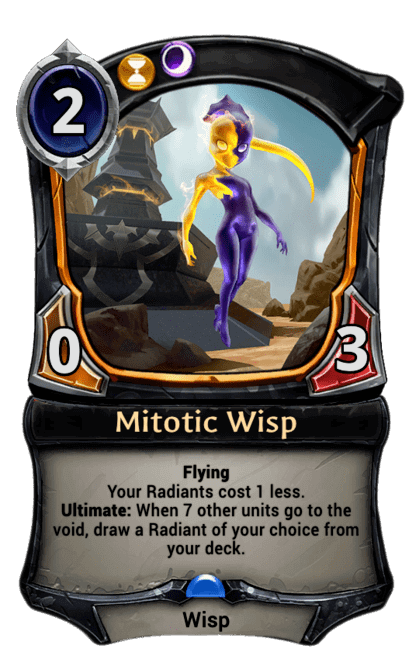 Mitotic Wisp is…interesting, but needs a lot of support if it is ever going to be anything more than a meme. Let’s hope this new Radiant reverses the trend. We know that Set 4 will include the Crest of Mystery to help you hit those Time and Shadow influence requirements. 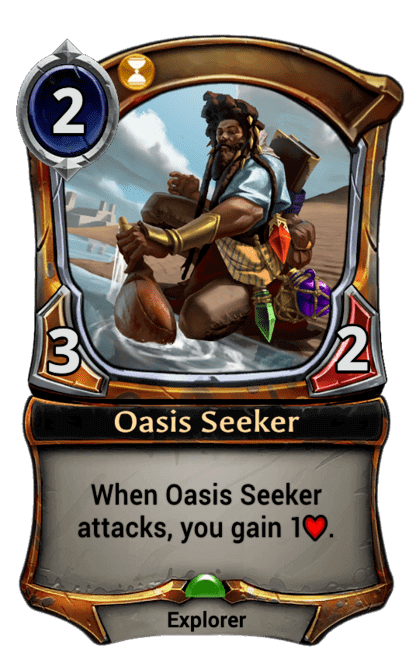 I don’t want to get my hopes up, but I’m really looking forward to seeing a stronger Xenan identity in the months to come. 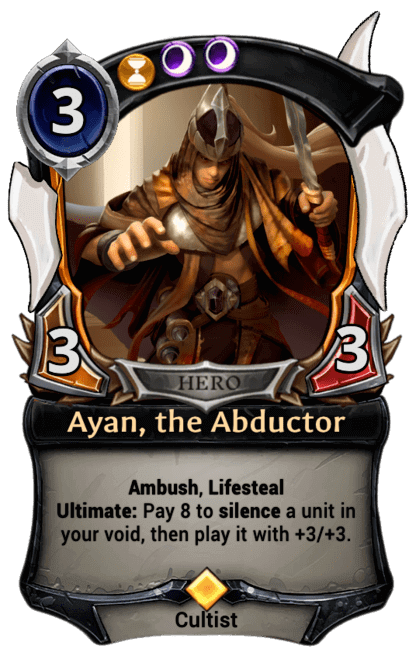 Too often I feel that the most successful Xenan lists are basically Ayan plus the same playable Time and Shadow cards which appear in other factions. Beautiful Radiant lady, there is a lot depending on you…please don’t let us down! Very likely an Explorer of some kind. Probably mono Primal but possibly Elysian. She appears to be…. Dawwwww! Look at that little guy in the back pack! So cute! Seems sort of familiar too. 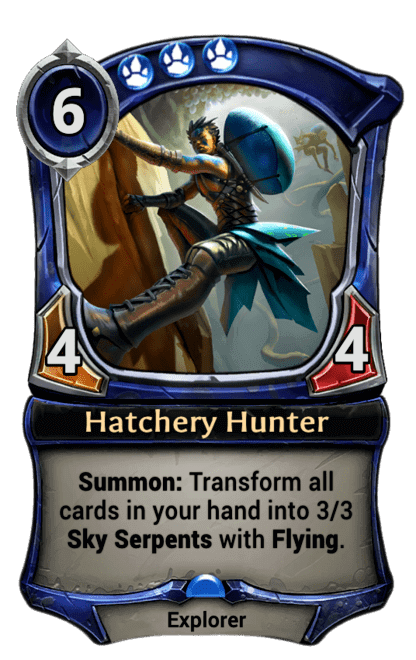 Though something about the climber’s expression makes you wonder if her reptile companion has perhaps been a bit too chatty during their ascension of this cliff. If I had to wager, I’d say that this scene is somehow related to a hatchery. 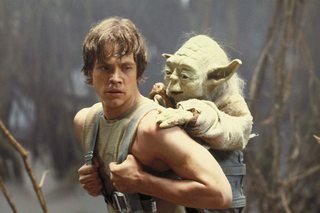 And that the little serpent doing the Yoda impression is a young Cloudsnake. Generally Cloudsnakes fly though, so this one either hasn’t reached maturity yet or is…injured perhaps? What else could this be, other than a conservationist Explorer airlifting a wounded sky serpent to Skycrag Veterinary Hospital? 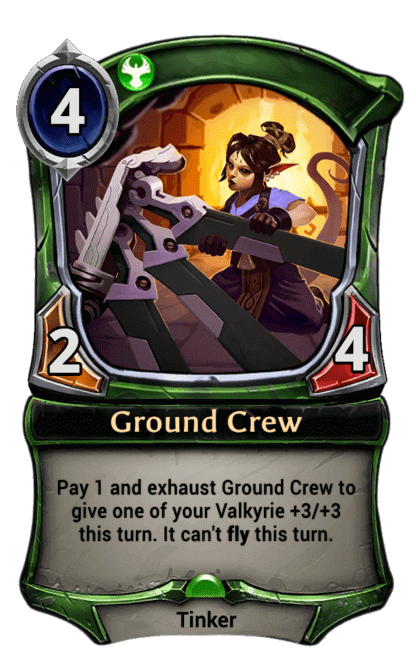 Perhaps this card does for Cloudsnakes what Ground Crew does for Valkyries. If that is not it, then I’m stumped. I’d love to hear what you think…please share your ideas in the comments section below. Here we have a bunch of dudes with shields standing ground near what appears to be the Spire District of Argenport. At least one of the dudes looks a lot like Civic Peacekeeper. I’m going to hazard a guess that this is some kind of defensive ability in Justice. A speculative risk, I know. Maybe this card will give you some Armor. Maybe it will make one or more of your Units invulnerable to damage. Maybe it will gives you some Armor and make one or more of your Units invulnerable to damage. Either way, these dudes have an important job to do. Because Myria’s capital city gets besieged a lot. Besieged by Clans. Besieged by Strangers. Besieged by by Rebels. Besieged by Clans again. And besieged by countless other tribes which have not yet been identified. Ooh – another Wisp sighting, this one looking a lot more like one of the Tormentor’s Spitelings. Terrifying and kind of adorable at the same time. 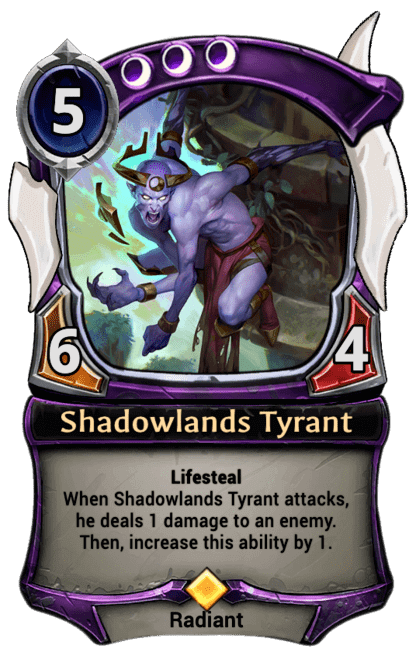 At first glance, this card appears to be mono-Shadow. But closer inspection reveals golden frills and foreground floaters, suggesting it could be Xenan. I doubt we will see any more Nightfall cards in Set 4, but if we do the starry background would make this one a good candidate. Meanwhile, the lush and woodsy setting is not something we have seen a lot of in Eternal so far. It could indicate that Wisps and their companion Radiants will be expanding their range throughout Myria in Set 4 — possibly with the objective of liberating the Tormentor? This guy seems ready to pounce from the treetops and claw your face off, which makes me think Ambush. 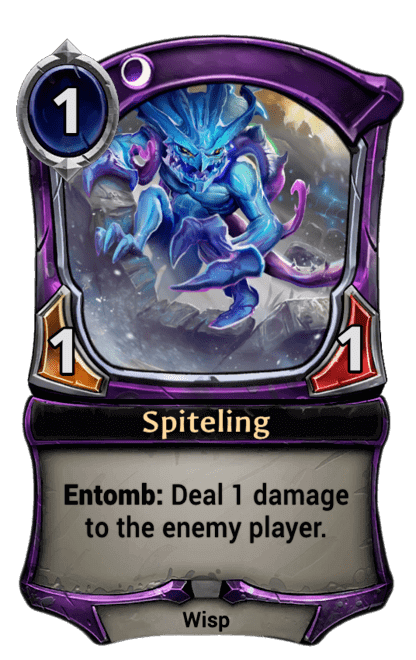 An Ambush unit that also has a Spiteling’s Entomb ability could be quite useful against relic weapons, something that Xenan decks sometimes struggle with. 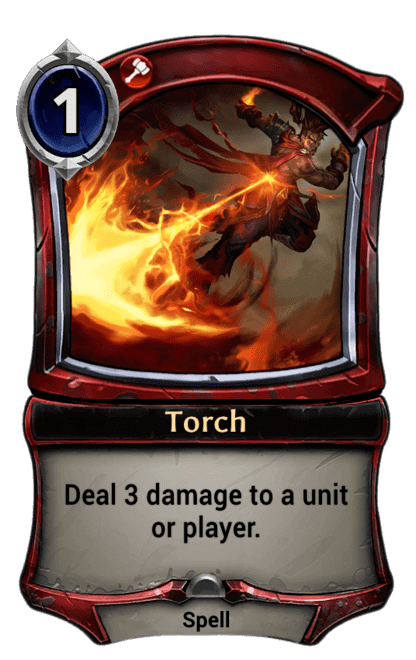 Whatever the ability, I’m excited for more Wisp-Radiant synergy. 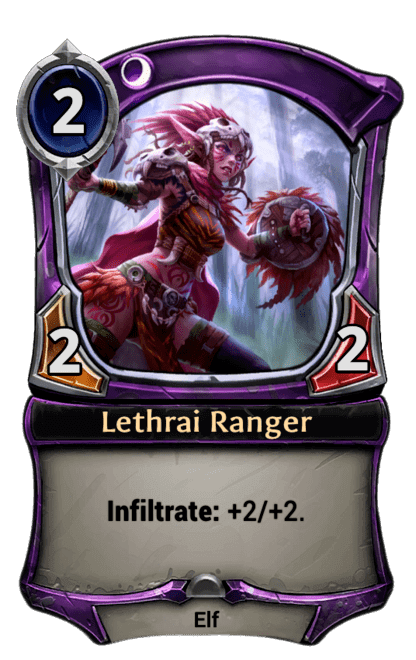 I hope that this card –along with the Radiant(s) that we met earlier — will empower some viable tribal strategies for Time-Shadow decks. …an Omens of the Past deck. In case anyone was wondering. Bit of a let down really. But I was stoked for Level 90 – Witching Hour Deck Image…w00t! Baa! 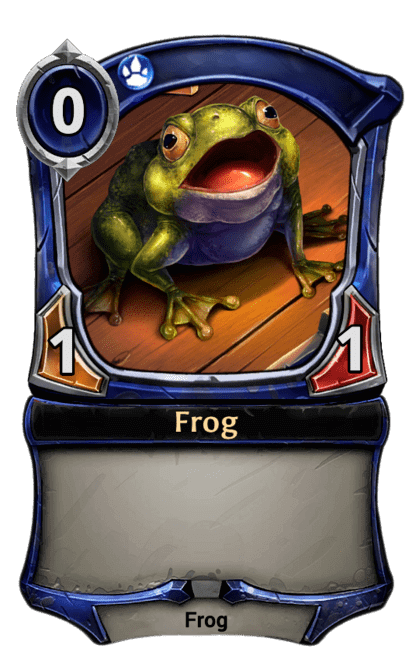 It always kind of irritates me when my cards turn into Pigs or Frogs. 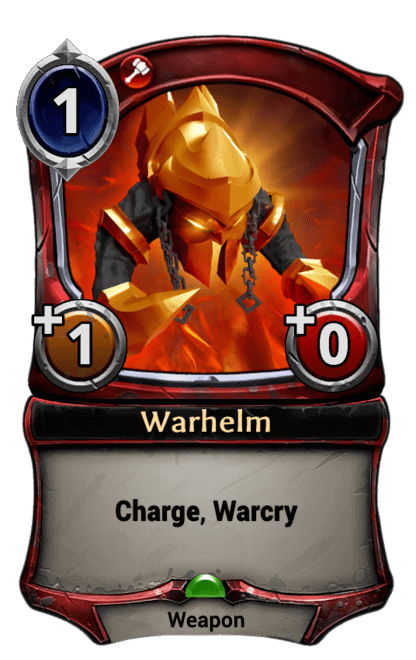 But I have a feeling I won’t mind so much when its this guy – who is most likely a token generated by a new Primal transformation effect. There is just something lovable about that cud-chewing face. When Sheep was first revealed on discord, there was some suggestion that the transformation might involve a choice…perhaps a bizarro version of Marisen’s Disciple‘s ability? 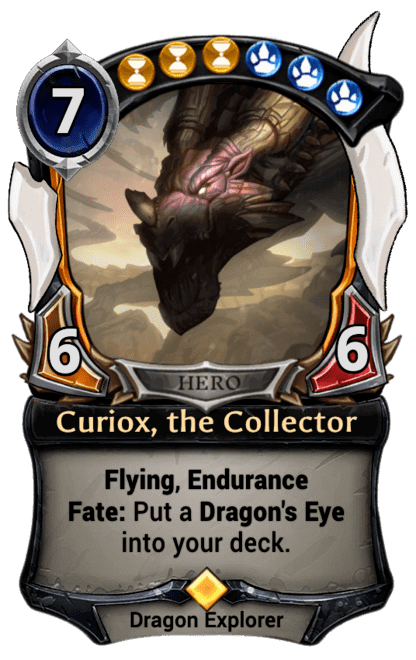 It has also been hinted that Cirso could be involved – but personally speaking I hope not, because I feel there are already too many snorting sounds in Eternal card game.